Jane has been working in payroll since 2008 and became assistant manager in April 2016. She will usually be the first point of contact when transferring your payroll to us. Jane is very experienced in all areas of payroll and dealing with HMRC and uses her payroll knowledge to process payrolls with incredibly high level of attention to detail and accuracy. Her calm nature gives clients a service they can rely on. 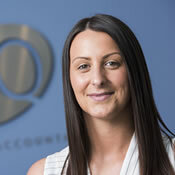 Our payroll department has grown over the past few years, especially with the introduction of workplace pensions meaning she now manages multiple staff members and is always trying to improve our service.